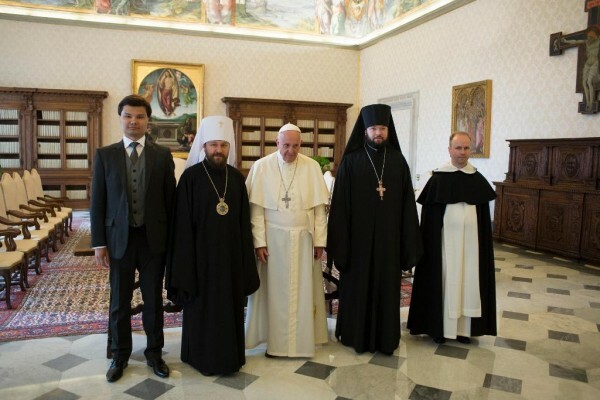 On 14-15 June 2015, Metropolitan Hilarion of Volokolamsk, chairman of the Moscow Patriarchate’s Department for External Church Relations (DECR), paid a working visit to Rome with the blessing of His Holiness Patriarch Kirill of Moscow and All Russia. 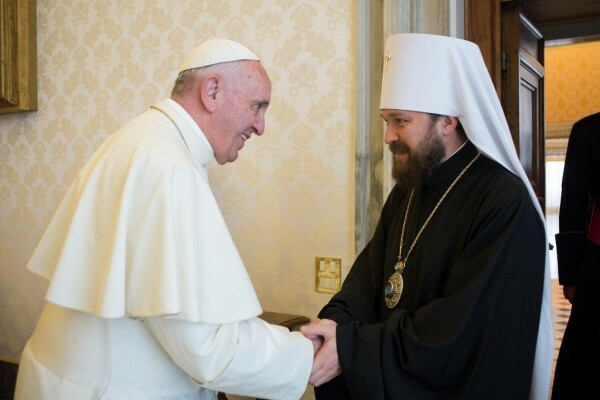 In the evening of June 14, Metropolitan Hilarion met with Cardinal Kurt Koch, president of the Pontifical Council for Promoting Christian Unity. They discussed various aspects of cooperation between the Moscow Patriarchate and the Holy See. Taking part in the meeting was Fr. Hyacinthe Destivelle, a staff member of the Pontifical Council for Promoting Christian Unity. On June 15, Metropolitan Hilarion was received by Pope Frances at the Apostolic Palace in Vatican. Metropolitan Hilarion conveyed greetings of His Holiness Patriarch Kirill of Moscow and All Russia to the head of the Roman Catholic Church. Discussed at the meeting were many issues including the dire situation facing Christian population in the Middle East and North Africa, the necessity of common actions in defence of traditional understanding of the family in modern society, and cooperation between the Roman Catholic Church and the Russian Orthodox Church in the sphere of culture. After the audience Metropolitan Hilarion introduced his suite to the Pope that includes archimandrite Antony (Servryuk), secretary of the administration of the Moscow Patriarchate parishes in Italy, and Mr. Miguel Palacio, a staff member of the DECR secretariat for far abroad countries. 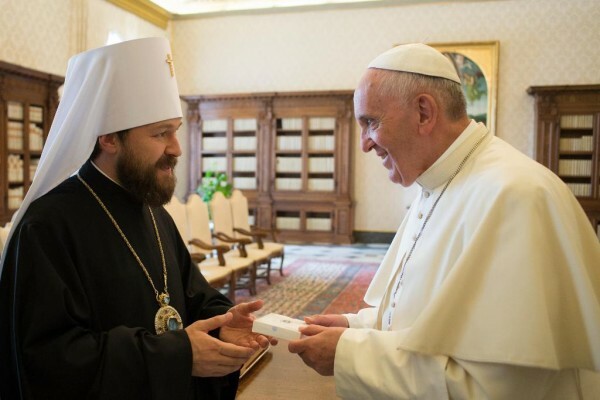 Pope Francis gave Metropolitan Hilarion and members of the Russian Church delegation a medal of his pontificate. The DECR chairman presented the head of the Roman Catholic Church a copy of the old Russian icon of the Saviour painted by protodeacon Alexy Trunin, a cleric of the Moscow church dedicated to the ‘Joy of All the Afflicted’ icon of the Mother of God. Before the audience Metropolitan Hilarion of Volokolamsk visited the Prefecture of the Papal Household, being accompanied by the prefects, and saw its exhibits, including pictures of Raphael and El Greco. Brought to Metropolitan Hilarion’s attention was the Crucifixion made of malachite and precious stones. It was presented to Pope Gregory XVI by the Emperor Nicholas I during his visit to Vatican that was the one and only visit of the Russian monarch there. That same day Metropolitan Hilarion returned to Moscow.